So I have mentioned before several times on our blog how we have been meaning to do a test shoot comparing the qualities of film vs digital for you all... Well, I still have yet to find the time to really do a serious shoot of side by side caparisons in varied lighting but recently I decided to bring my D300 to test lighting on a shoot and realized afterward that I had some of nearly the same shots on digital as I had on film. 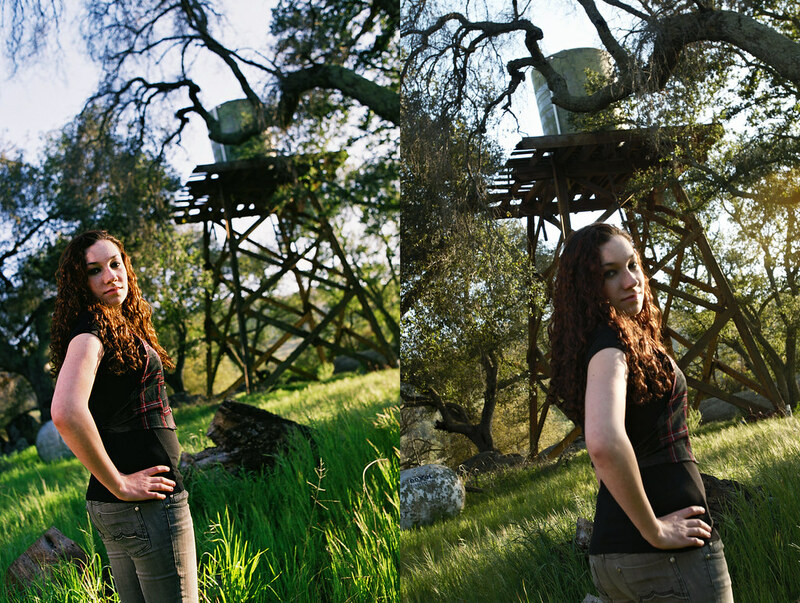 These were all shot at the same settings on both film and digital. The digital is all on the D300 with a 17-35mm lens at f/4 and 1/250 at ISO 200 and the Film is on an FE2 with a 35mm lens at f4 and 1/250 on Fuji PRO 160s. The differences are subtle in some areas and obvious in others. 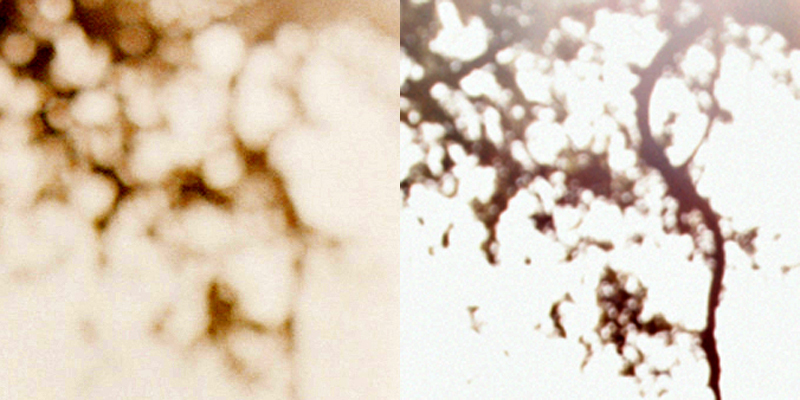 For our first example we will talk about general color and continuity. 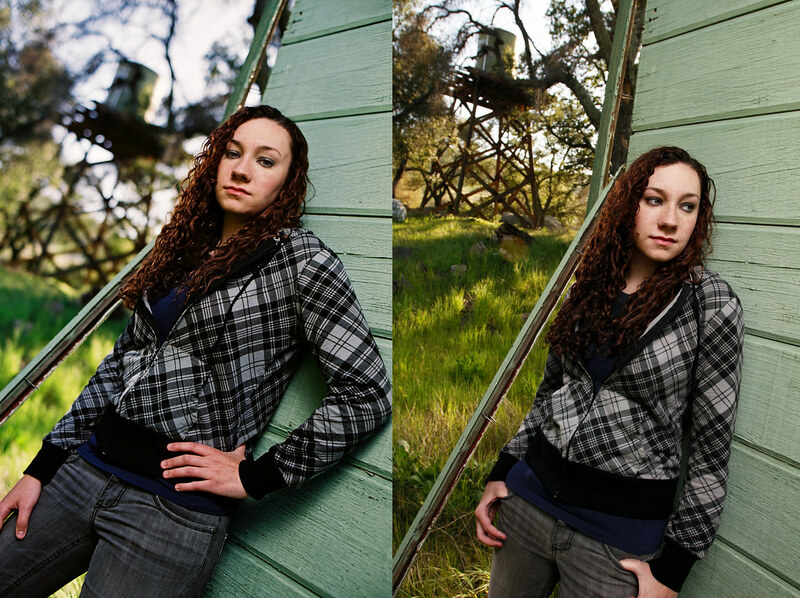 Both of these shots were only corrected slightly in Photoshop to match color and lightness. Of coarse the digital was shot in RAW and processed in Capture One to maintain highlights and continuity. But overall there has been minimal manipulation to all these images. Can you guess which is the film? It should be obvious. Which one looks better? I know the DOF is a little different but the main difference here is the subtleties in color. Look at the greens in the background! And the pale blue in the sky. Just looking at the paint color contrasted against her skin the film shot (on the left) has a much wider and more pleasing range of color. I can only imagine the differences on print! The film seems to have more separation in color and contrast without loosing detail. This next one is a lighting issue. I know this isn't the greatest lighting situation, especially for digital, and I normally wouldn't choose this photo but here it illustrates a point. Why is it that one of these seems to have more contrast than the other yet at the same time feels more natural and soft as well? It's because the one on the left is film! In order to maintain detail in the highlights of the digital shot I had to darken the exposure leaving the midtones flat and without pop. With the film, straight from the lab, there is tonal separation and detail all throughout the image. Color is better here as well. Her face shows detail and richness of color on film yet with the same lighting on digital is blah... Yuck! Which looks digital? Film has nice soft transitions to a smooth creamy highlight where digital just peaks! I brought the exposure way down on the digital but it still gives me nothing! This is why so many digital photographers have to spend so much time on their computers developing techniques to hide the flaws in digital. Don't get me wrong, I have great respect for a good many brilliant digital photographers who do a wonderful job shooting and in post-production. But I can't do it. I can't spend the hours in Photoshop playing with film emulators when I could just shoot the real thing. The point of this blog entry is not bash digital or those who use it but merely to show why we use film. I hear so often, "So when are you going digital?" or "Wow that's an awesome picture! Did you shoot that in RAW?" and "Film? But isn't digital better?" People think that megapixels and large price tags on fancy cameras make for good pictures. But in actuality 99% of the pictures from your wedding will never be looked at at larger than 6 megapixel and film has a quality to it that can't be reproduced in digital. It's a combination of dynamic range and the way that film reacts to light that makes it more natural and down right beautiful! And a great lens is a 1000 times more important than a camera body. But what it really comes down to is that the talent is in the artist and that artist should use whichever medium they feel most pleased with. But if you ask us, we will always tell you the truth... We love film! Because it's just better! Some good digital... To be fair. For a more detailed and competent analogy of what I'm talking about here, check out Ken Rockwell's web site. @ Anonymous - Blue Lily... Yes. Should I have excluded her? There are much worse out there. What's especial bad about Blue Lily? Completely agree on the highlight clipping problem on digitals. Thanks for taking the time to post your comparisons. It'd be great if you have examples of switching lenses (or use the same lens). The 35mm f/2.0D is 6 elements in 5 groups, whereas the more complex (and expensive) 17-35mm f/2.8D is a 13 element in 10 groups. That's nearly doubling the light path, and I suspect the added glass can degrade color as well, regardless of its slightly better MTF data (at 35mm) when compared to the 35mm f/2.0 lens. Also, just out of curiosity, can you tell us what filters you have on the 17-35mm (paired with the D300) and the 35mm (paired with the FE2)? Also, what setting are you on with the D300 (Active D-Lighting [under-expose], Picture Mode)? Thanks, looking forward to seeing more posts from you. Wow! I'm hit! I'm hit! Taking me down wit all that technical jargon. These comparisons aren't that scientific. I just had the shots and threw the post together. But here we go. Actually I wasn't shooting the 35mm f/2.0D. It was the inferior 35mm f/1.4D. Inferior in sharpness, but that bokeh! And I'm not sure that the different lenses would do much to the color. I've shot both on my D300 and haven't noticed a difference. The 17-45 seems better with color and contrast actually. And no filters on the lenses. Just raw glass! I shot both cameras on manual and the D300 I shot in Raw and processed in capture one to adjust temperature and exposure. Also added a little contrast to the curves. But that's it. No other post production on either the film or the digital. I plan on doing a more scientific study of film against digital soon. Working on it now actually. Pairing my trusty $300 Fuji GS645S against my D300. Stay tuned! Gotcha, I only presumed that you were using 35mm f/2.0D because it's AF, however then I just remembered that it's on a MF FE2 with no in-body motor. The 35mm f/1.4 is a manual focus (no "D"-istance information is sent to the camera). Looking forward to your comparisons! P.S. I love the FE2, it's built like a tank and the build quality is unparalleled. Yes. You are right. No D. My bad. Thanks! whoa, this is in DIRECT contradiction to what the guy at best buy told me, now I'm so confused. I thought more megapixels are better????? Does film even have megapixels? And how can you take a good picture if you can't see it on the screen right away? Hahaha. Sorry, just kidding couldn't resist. Haha! Yeah I know. So... Since you two are married and everything you totally talk with one voice now? "Zach and Katelyn Hodges said..." Haha! Is this Zach ore Katelyn? it's zach, somehow we're permanently logged in as zach and katelyn, not sure how it happened but I don't mind it!